I find that peace is a springboard. A person at peace can make better choices, can love well, can be gentle and faithful and have self-control. A person full of peace can endure much longer than a person without it. It's like the fertilizer that grows the rest of the garden. I grew up in a household that was anything but peaceful. As a result, when I left the house at 18 I didn't feel loved, I was not joyful, I knew nothing of faithfulness or goodness. I lacked self-control. The lack of peace in my house stunted the growth of all of the fruit of my soul. I left that house an empty vessel, not knowing I was worth loving, or anything at all for that matter. Since then I've been on a road to making my own peace. It's been a long journey. In fact I have often said it would take me 18 years to undo the first 18 and that proved to be true. But God has been faithful, the more I cultivate these fruits, the more fruit I have. Are you in a place you could use more peace? I think we all are. 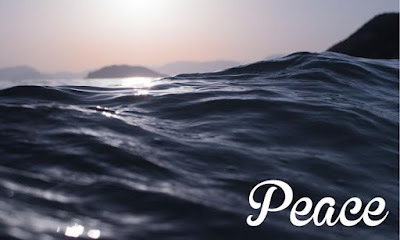 I thought I would share a few ways that I use to become more peaceful. --Focus on the next right thing. I've said it for years. When life seems disrupted and chaotic, it is difficult to be peaceful. It's difficult even to know what to do when the list seems so long. So don't look at the whole list. Just do the next right thing. --Give it to God. I don't mean that as a cliche at all. If you are dealing with a difficult situation and you know you have done all you can and are at an end, give it to God. Repeatedly if necessary. Sometimes the only prayer I can muster is "this is yours, Lord". -- Forgive. Yourself and others. This is a one person activity if need be. You don't need an apology to forgive. You just do it. Forgive yourself for the ways you have failed, write them down and learn from them. --Don't compare yourself to others. Comparison is the thief of joy. Every time. Decide to love you as you are!! That doesn't mean you can't improve but the first step to improving is accepting yourself as is! Extend this to others as well! Love them where they are and how! --Do something different. I find that if I am in a non-peaceful funk, I just need to switch things up a bit. Maybe I'll paint or draw or go for a walk. If something feels like you are forcing it, walk away for a while until your peace returns. The thing is, we were created to be peaceful. The potential is there, just like with a seed. We just need to purpose ourselves to tend to it. How do you find peace? I'd love to hear!